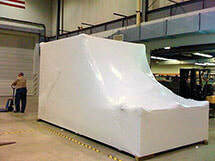 VCI shrink films are manufactured in thickness up to 300mu. The films can be used where the heat is applied by hand or machine. The VCI technology provides corrosion protection for a wide range of metals. As with most films they can be coloured to suit special requirements.